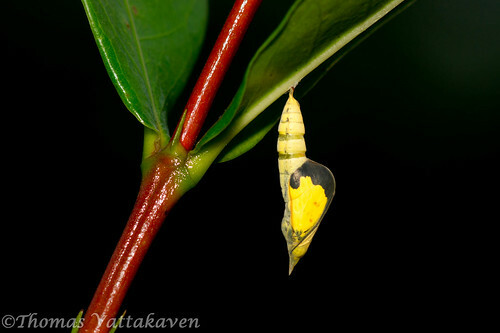 In my last post, I had captured a sequence of images over 22hrs, showing the metamorphosis of a caterpillar into a pupa. 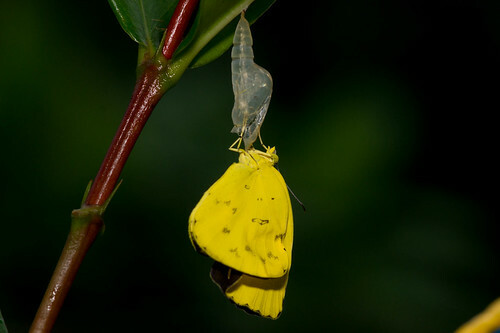 This time, I am showcasing the next step of the butterfly’s life cycle when it transforms from pupa into an adult butterfly (imago). This time however, I didn't have to wait as long to capture the entire sequence. 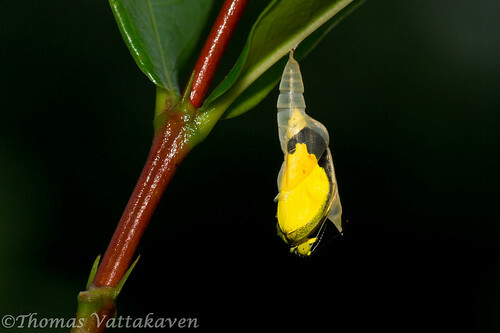 I knew the pupa was ready to hatch, as the day before, its wings were well visible through its pupal case. On the morning after, the wings were even more clearly visible. 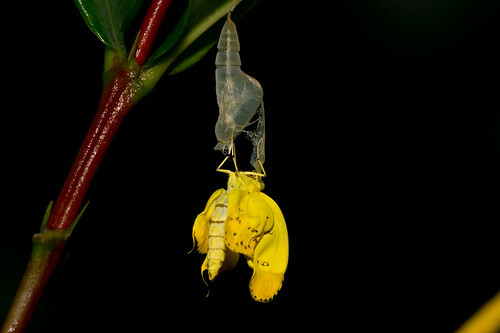 It was just a matter of hanging around till the pupa showed signs of hatching. 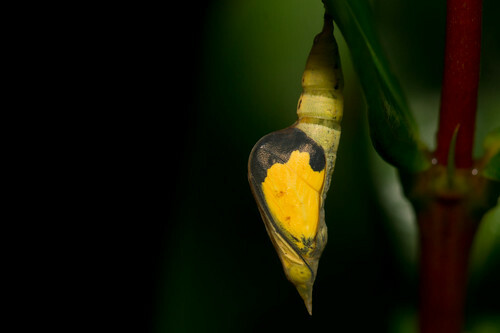 The emergence is triggered by various factors such as humidity, temperature, light level, and time of day. 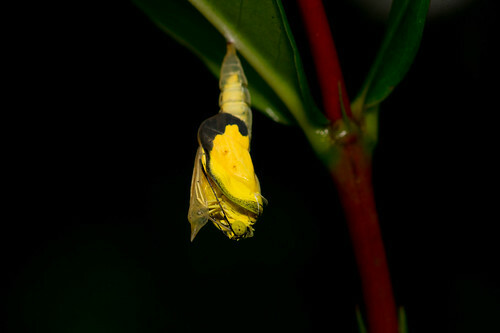 Most butterflies including this one emerges shortly after dawn. 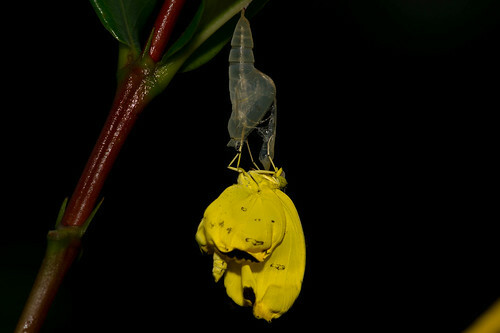 The hatching of the pupa once again began on its dorsal side, and I had to carry all my equipment and reset it quickly to catch the action at the back. 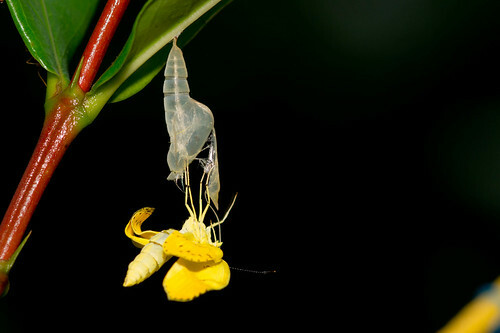 The splitting occurs as the butterfly draws in air through its spiracles and expands its body. 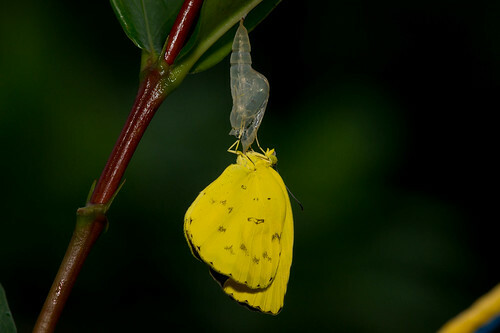 Once the pupal case was split open, the butterfly seemed to push from within, with its back and its legs, widening the split further, allowing enough room for the imago to wriggle out. 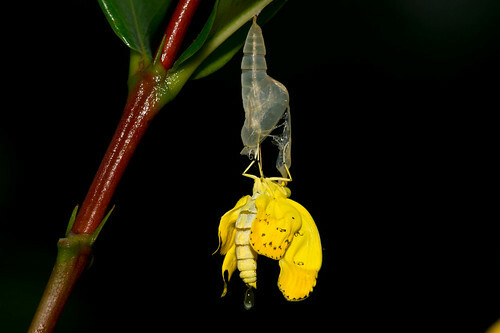 …and then all of a sudden, the imago was completely out of the pupal casing, and it did a back flip, while still attached to the old skin. 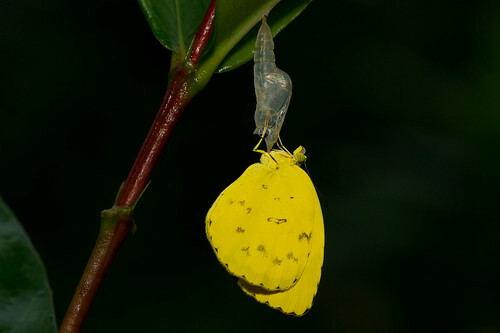 As the butterfly emerges, its wings are still crumpled and its body is thick and small. 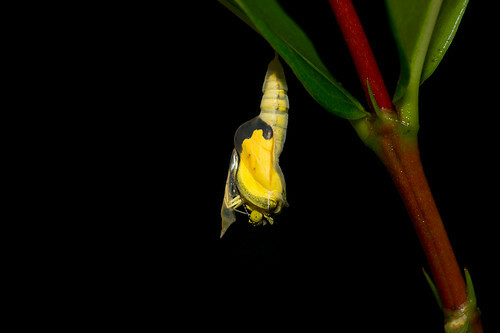 However, as it hangs onto the pupal skin, it discharges a liquid from its hind end (see above image). 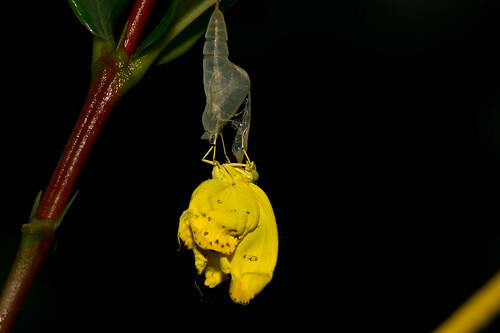 This liquid is the metabolic waste that the pupa has accumulated. This waste is called as the meconium. 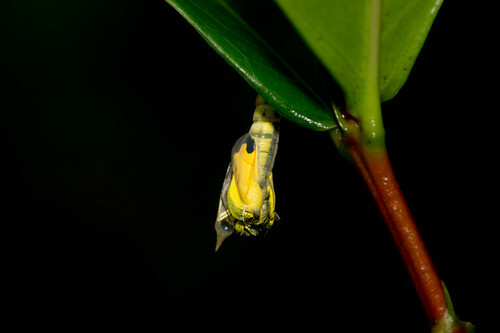 Once the meconium is expelled, the abdomen of the imago becomes thinner and longer. 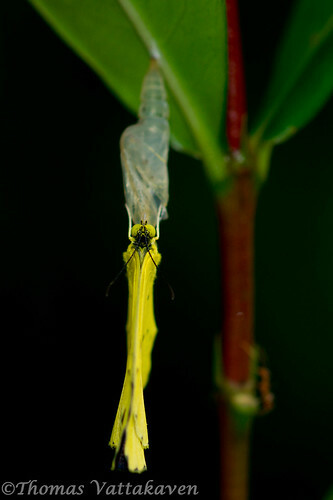 The butterfly then hangs seemingly motionless. 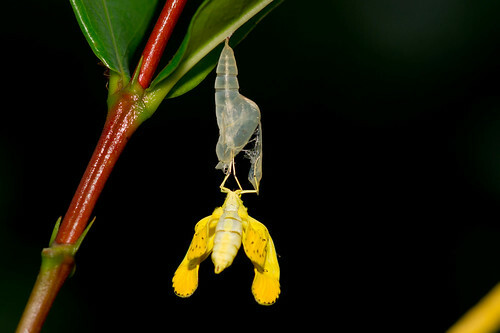 During this time, it pumps fluids into the wing veins, causing the wings to expand to their full size. 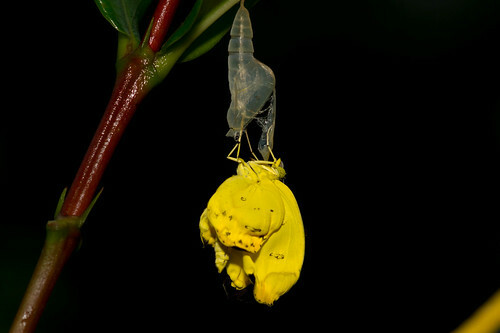 This expansion is documented in consecutive images shown below as the wings straighten out. 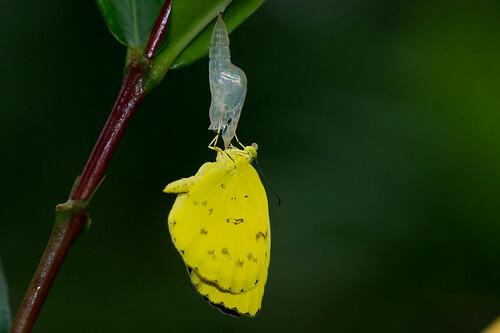 Once the wings have straightened out, the butterfly then basks in the morning sun, waiting until the wings have hardened. At this stage a perfect specimen has just taken shape. 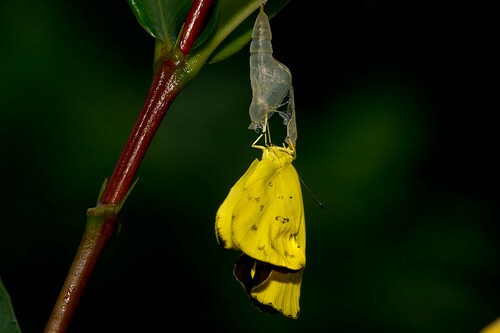 It is now an adult butterfly and ready to fly off and start the cycle again. 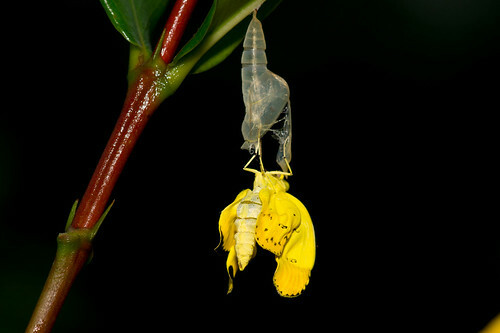 Although males do not wait much longer, the females wait around the pupating location for a while. Do you know why? To find the answer watch this space for the next post.